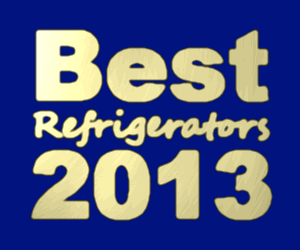 The PRO 48 from Sub Zero is a very versatile refrigerator. 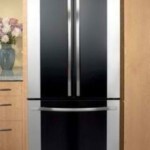 Built-in or freestanding it’s a fridge that can make an impact in just about any style of decor. Is the price worth it though? The Sub-Zero Pro 48 is available with a glass door or with a regular stainless steel one on the fresh food compartment. It has three evaporators and uses a sculpted metal. You can build it in or leave it freestanding. The stainless steel model uses the 648PRO model number and the glass door uses 648PROG. 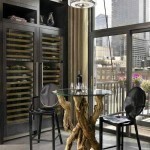 Choose the door style depending on how organized you are and your overall kitchen design. Here are 6 drastically different designs that use this fridge from Sub Zero. Kitchens Unlimited doesn’t state that this fridge is the exact one used but a commenter on Houzz.com suggests it is the model used. This room is filled with very subtle details that you notice the more you look at it. Almost everything in the kitchen has a special nuance to it like the three pendant lights over the sink or the turquoise island. The glass door model (648PROG) fits in well here because while it appears neutral with the stainless front, the glass door gets noticed upon closer inspection. Either Sub-Zero model would’ve worked in this more contemporary design by East End Country Kitchens. Notice that the cupboards above the refrigerator actually have glass in them which would’ve coordinated with the PROG model. However, there is already so much going on this room from the oversized lighting to the Bertoia barstools and the Big Bang XL Foscarini light that the plainer fridge is a smart choice. The star of the room is the stained gray wood cabinets. If it was just a painted cabinet in the same color than the appliances would’ve been featured more. 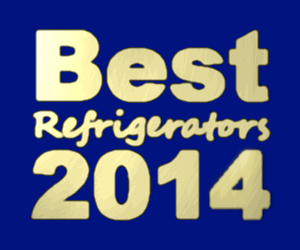 The French door style and double freezer can have almost a vintage flair to it, even in a metallic finish. 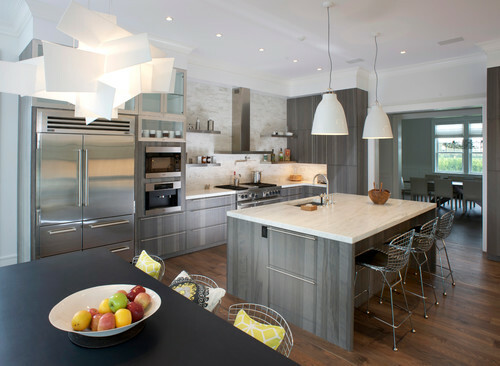 What’s really interesting about this kitchen are the competing metal tones. Instead of choosing more of a farmhouse style appliance with a custom panel, stainless is paired against a copper range hood. Since the cooper is aged it coordinates with the wood beams better. The price is similar regardless of the door style you choose. The glass door model has an MSRP of $15,970. The door is supposed to resist UV rays. The stainless version also shares the same MSRP. Stainless steel isn’t a typical choice for a rustic room but Ward-Young Architecture & Planning pulls it off in this kitchen. 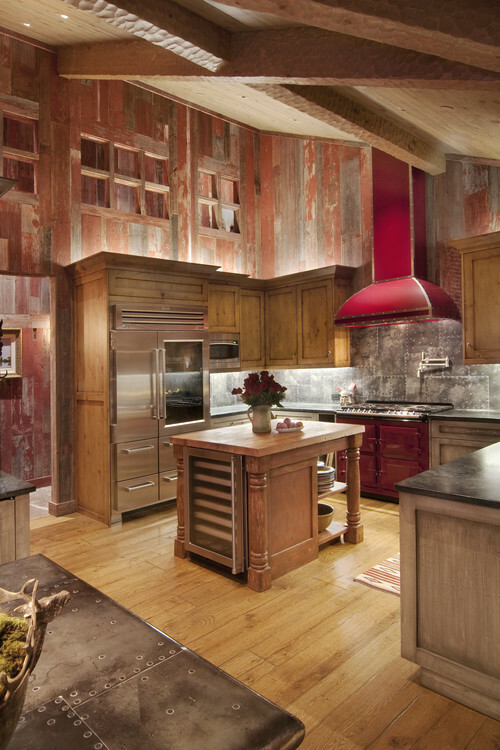 The barn wood on the walls has some gray tones as does the distressed metal backsplash and table. The glass door showcases food which is a common decorative accessory as evidenced by the eggs on the island. All of the competing finishes and textures would probably be too much in this room without the more modern stainless finish. Plus, the red vintage style stove and range hood would be next to impossible to replicate on a refrigerator but again the stainless accents still coordinate with it. 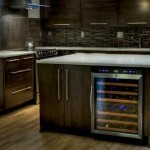 Typically you would find glass doors for sale on commercial style appliances but they are popular for home use now too. Use the glass door style in an industrial kitchen with subway tile walls, open shelves, and metal barstools. Add in warm touches with floral arrangements and red knobs on a Wolf Dual Fuel range. 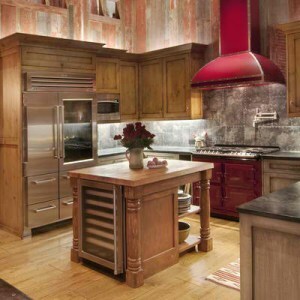 This style of kitchen showcases the appliances the most because of the simpler color palettes and materials. 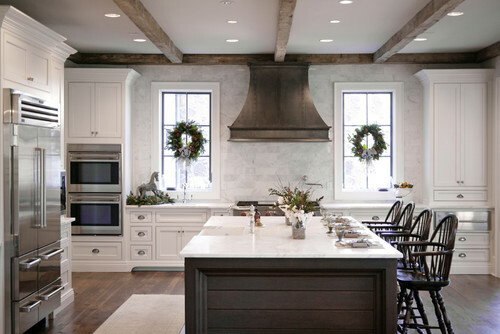 There are both traditional and farmhouse elements again in this design which makes it perfect for 2013. 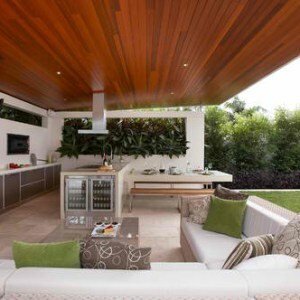 This kitchen uses a lot of open space. 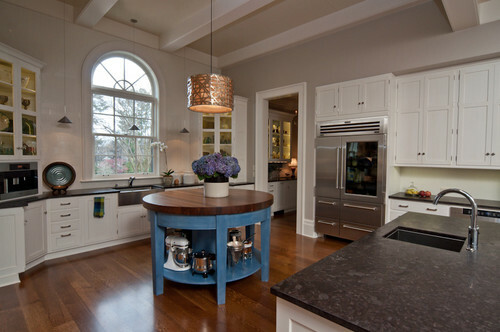 Most of the cabinetry and appliances are tucked away in arched niches adding to the airy appearance. The glass door fridge gives the same feeling to this room. When spending so much money on a refrigerator you want to get one that will appeal to home buyers in case at some point in the future if you decide to sell your home. Even if the kitchen design or becomes dated the Sub-Zero Pro 48 can coordinate with a lot of other design visions or plans which makes it a timeless choice. Which kitchen style is your favorite?